After a week of temperatures nearly reaching triple digits, I think it’s finally summer in Syracuse! So far, I have gone hiking, camping, golfing, and to the beach. I will admit, once in a while, I got a little too excited and forgot to reapply my sunscreen. Yikes! For my sunburns, I revert to my good ol’ organic aloe. Yet sometimes, I need a little more than that. That’s when I reach for MyChelle’s Fruit Enzyme Mist. This cooling spray applies enzymes onto the epidermis of my skin to help breakup dead skin cells. That helps quicken the healing process and alleviates a lot of peeling that may occur. It also has anti-inflammatory properties, so the redness goes down almost instantaneously. Because it is in a spray bottle, the mist can easily get to those hard-to-reach places like your back and shoulders. 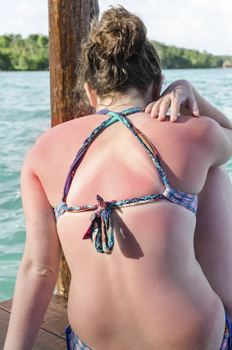 Sunburns are not fun, nor, good for your skin. So please remember not only your initial application of sunscreen but reapplying it when you have all that fun in the summer sun! If you answered yes, sea buckthorn should be your right-hand man this summer. Sea buckthorn has natural occurring omega 3,6, and 7 (palmitoleic acid), vitamin E, and vitamin K. All these are important for skin recovery. The omegas will help with the inflammation and redness. Vitamin E, as most people know, is extremely soothing, like aloe vera. 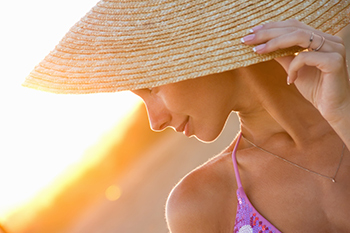 The Vitamin K will help prevent “sun spot” damage to the skin! You can find this in a body wash, facial wash, body lotion, facial lotion, bath bars, and my favorite… body oil! Weleda Sea Buckthorn Body Oil is AWESOME for after the beach and the light citrus scent is so refreshing!